The 2nd ROBO-ONE auto sponsored by Biped Robot Association, took place at Kanagawa Prefectural Youth Center in Yokohama City, Kanagawa Pref. on Sep 23, 2017. ROBO-ONE Light 15th also took place on Sep 23rd and 4.5m Footrace as the preliminary ROBO-ONE 31st Tournament and the main event ROBO-ONE 31st Final Tournament took place on Sep 24th. The major regulation of the 2nd ROBO-ONE auto were just autonomous robot could join the tournament and the weight of robot, which was 5 kg or under. Details of the body regulation were described in the 31st ROBO-ONE, the 15th ROBO-ONE Light Regulation and the 2nd ROBO-ONE auto (in English). Side punch has been prohibited since ROBO-ONE 23rd Tournament in the robot fight. Twenty-five robots joined the competition. The tournament winner was King Puni custom-built by Osaka Sangyo University Puni. The 2nd place was BLACK TIGER NEO by myself, IKETOMU. The 3rd place was KOBIS by BISKO. Result of the tournament is here. 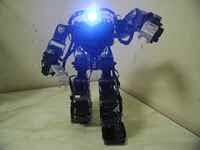 My autonomous robot, `BLACK TIGER NEO` also joined the tournament and got the 2nd place. Almost autonomous robot had sensor system as PSD and/or ultrasonicwave sensor. 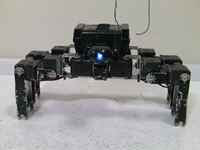 It was difficult for almost autonomous robot to find the robot in long distance such as 1 m over. The winner was Dezafines O Rantan. The winner was Golio Hepiarms. The winner was King Puni. The winner was BLACK TIGER NEO.